When putting together my Kitchari Challenge, I asked some friends for their favorites. This one is the favorite of my friend Jynne and from Kurma Dasa. Click for the original recipe. I really liked the addition and punch of flavor with the veggies added. Great choice Jynne! 2. 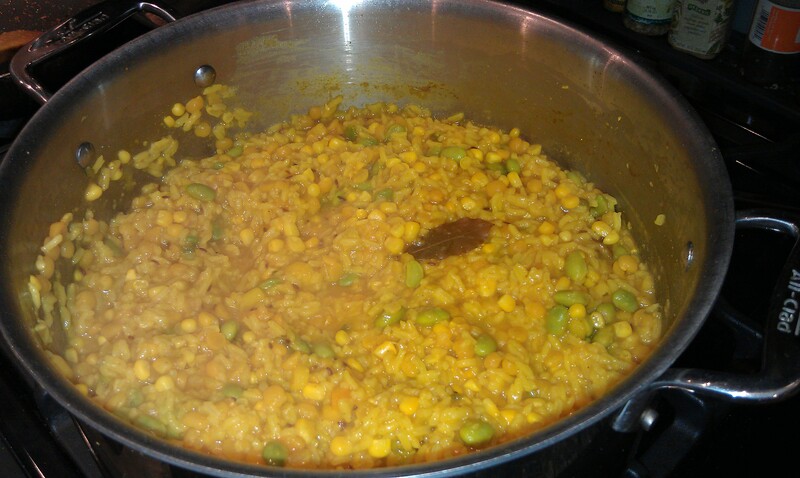 Add rice, vegetables, and salt, increase heat and stir as you bring to the boil, then return to a simmer, covered. Cook for 10-15 minutes, stirring occasionally, or until rice is soft. 3. Heat the olive oil in a saucepan over moderate heat. Add the cumin seeds and fry until a few shades darker, then add asafetida powder, then stir through the big pot-o-stuff and cook for another 5 minutes.